Do y'all love to cook like me? I am one of those people who will come up with and work on a recipe for years before I think it is just right. I love the creative chemistry that happens in the kitchen. For years I learned about making my favorite food group, Mexican food! There is one thing I need to learn to make in order to make a complete meal. I want to make some salsa that will knock your socks off. 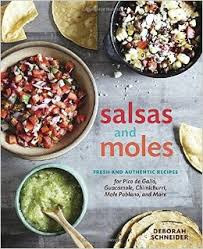 Enter Salsas and Moles. I read through this book and was really impressed with the large amount of information given. I had no idea how many varieties of sauces there were out there. I didn't know exactly what made a mole a mole. I wanted to share in case you are like me and want to make rocking salsa. I have begun my experimenting and preparing to be the best salsa maker in the tri-county area. This book was graciously provided for review by Crown Publishing.